Behind The Latest Round Of Bruised Feelings At The Minnesota Orchestra : Deceptive Cadence A blogger charges that management at the Minneapolis-based symphony may have attempted to undercut pro-labor organizing efforts — several months before talks between the musicians and the administration failed. The orchestra association says that they were just doing their job. The chairs are still empty in Minneapolis, but all sides in the Minnesota Orchestra dispute have been busy trying to snap up web domain names. About a week ago, a semi-professional musician, blogger and longtime fan of the Minnesota Orchestra named Emily Hogstad was talking with some fellow Minnesota fans about the possibility of organizing a dedicated group of music lovers who want to see an end to the longstanding labor disputes at the Minneapolis-based ensemble. 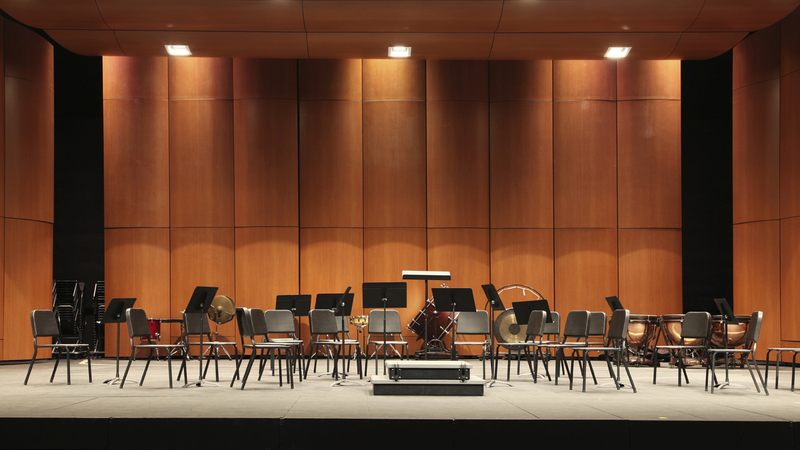 After new contract negotiations failed, the orchestra musicians were locked out by management in October 2012, and the orchestra's situation seems to be growing more dire by the week. The orchestra's 2013 summer season was canceled, and the orchestra's website does not list any regular subscription concerts for the coming 2013-14 season, though the season has not officially been canceled. Music Director Osmo Vanska told his board in May that he will resign if the lockout is not settled by September. Earlier this week, the Swedish label BIS, which is in the middle of recording a full Sibelius symphony cycle with the orchestra, including an installment that earned a Grammy nomination last year, has postponed any further recording sessions with Minnesota until the musicians' contract has been resolved. "We feel that every orchestra actually has three legs, like a stool," Hogstad, who lives in Eau Claire, Wisc. and has no professional or financial ties to the Minnesota Orchestra, said in a phone interview Thursday. "Management and the board, that's one; the musicians are another; and the audience is the third. Throughout this crisis, we feel like the audience has been ignored. And we want to be a vehicle for concrete community action to return world-class music to Minnesota." Hogstad and her friends agreed that they wouldn't decide on their new group's name until they could find an available URL. They started brainstorming. And it turned out that for nearly every name they came up with, the domain was already registered. www.saveourorchestra.com. Taken. As were ten more URLs they came up with. Hogstad started wondering who had already bought access to these names. As it turns out, it was the Minnesota Orchestra itself, months before negotiations soured. Wednesday afternoon, she published on her blog a long and fiery post about what she had discovered. Was 2012 The Year That American Orchestras Hit The Wall? To some prominent industry observers, the tactic seems antagonistic. Orchestral consultant Drew McManus posted his own commentary on the situation today. In a post titled "So Much for Good Faith Bargaining," he wrote: "Perhaps unsurprisingly, most folks won't be shocked to learn that the MOA was digging the proverbial trenches for a long term siege well in advance of talks officially breaking down. Simply put, it is a clear indication that the employer had little to no intention for negotiating in good faith." Orchestra management, however, says that they're simply following common and widely accepted business practice, and don't understand why Hogstad's findings are attracting international attention and commentary. Using the publicly available tool of the WhoIs database, we independently verified today that all of the domain names which Hogstad has listed — both ones that would be specific to the Minneapolis group, like www.savetheminnesotaorchestra.com and www.savethemnorchestra.org, and very broadly generic URLs like www.savetheorchestra.com and www.savetheorchestra.org — were acquired on May 24 and 25, 2012 by the Minnesota Orchestra Association (MOA). This afternoon, the MOA confirmed that they had bought these domains. The total costs of the 13 domain name purchases, each bought for two years' registration, were $325, and were paid for by MOA funds, said Gwen Pappas, a spokeswoman. Pappas added that such purchases are "common business protocol in any organization," and that these 13 are among approximately 40 total URLs owned by the MOA. She said that management was already anticipating that negotiations were most likely going to be difficult, and considering that the orchestra was at that point already facing a $6M deficit, the intent of the purchases was to find a way to "protect the institution and share our messages." In corporate practice, bulk domain purchases — which are indeed common — are usually afforded some measure of privacy by hiring third-party buyers to execute the acquisitions, with the intention of masking business strategy. In most of these instances of the known May 2012 domain purchases, however, the URLs were publicly registered under the name of Gean Halstead, who is listed on the orchestra's website as their director of information technology, with the organization listed as the Minnesota Orchestra Assn. at 1111 Nicollet Ave. in Minneapolis, which is the address of the Minnesota Orchestra's hall and administrative offices. A few other domain names were publicly purchased under the name "MOA Administrator," with the Minnesota Orchestra Association again named as the purchasing organization, listed at the same address. However, Hogstad points out the similarity of many of these domain names to other sites that take an expressly pro-labor stance, such as www.saveoursymphony.org, which was purchased and used by supporters of the musicians of the Detroit Symphony Orchestra during their extended and difficult labor negotiations. Henson had no comment. MOA spokeswoman Pappas said that while she would not speak about the timing or nature of specific conversations between MOA leadership and other institutions, "The orchestra has definitely had lots of conversations with all kinds of organizations who have gone through contentious labor negotiations, to seek advice and counsel." Hogstad said that her general complaint still stands: "It seems like the MOA is deliberately putting up barriers for anyone trying to advocate on behalf of the musicians." The MOA asserts that they are following standard corporate business practices — even though those tactics may strike some in the arts world as objectionable or unseemly. "Just because you're planning for a scenario, it doesn't mean that you want that scenario to unfold," Pappas said.